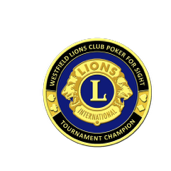 EXCITING NEW AWARDS - Starting in Spring of 2019, the we will now be awarding commemorative challenge coins to all players that advance to the final table! All players that finish from 2nd to 9th place, will receive the silver "finalist" medallion and the tournament champion will receive the coveted "Tournament Champion" medallion! %100 of the proceeds go to CYSTIC FIBROSIS FOUNDATION.